Started out with 20 t-shirts....finished all of the blocks last night. Now making the strips and cornerstones. Unfortunately, this is my first DIY quilt and I am not sure of the steps to keep it simple. I've already cut the sashing strips and so I have to sew the cornerstones on separately. But that's ok -- still have two months to get it done. 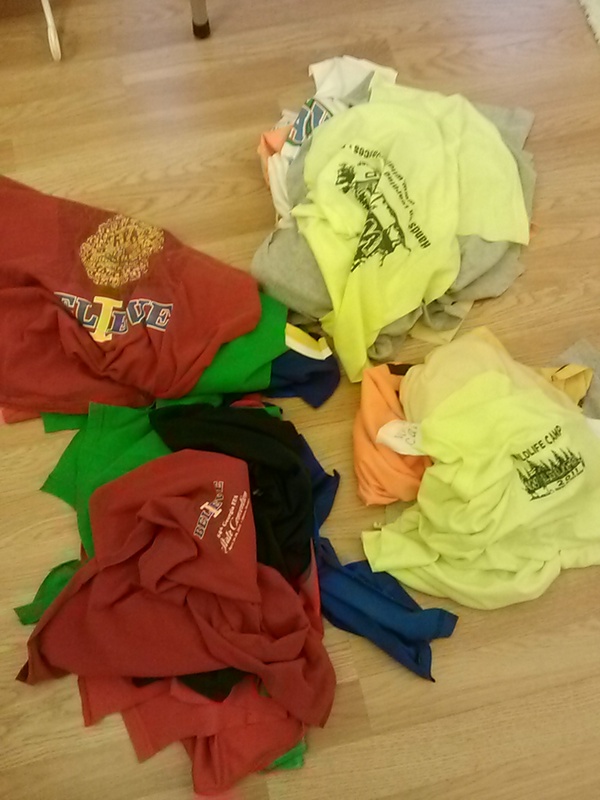 Here's a pic of the t-shirts before and after cutting and stabilizing. 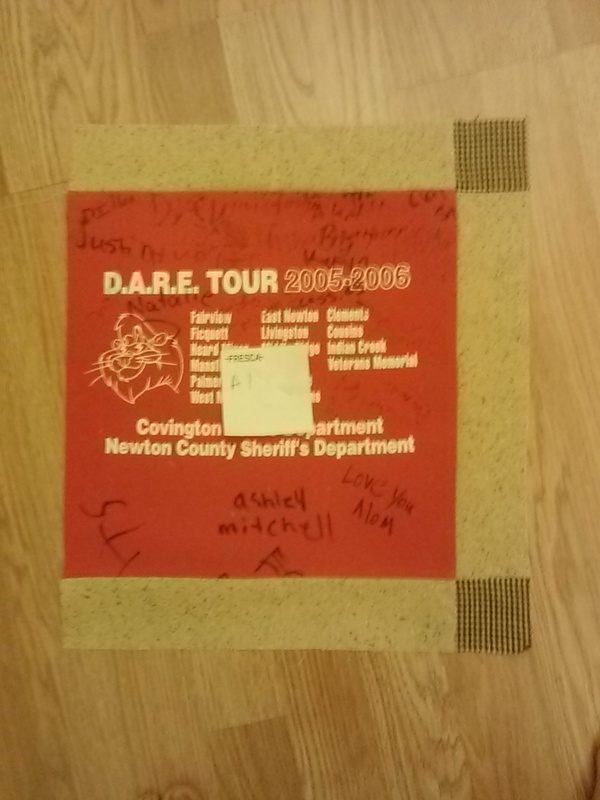 I have one block partially sewn, just to give an idea of the colors for the sashing and cornerstone. He wanted tan and beige colors. Decided to make one block first to see how it looked and get approval from the Mom. She likes it so on with the sewing. Next -- how to quilt....suggestions?? Looking good and a large all over meander would be nice if you can FMQ. If not, SITD down the sashing and an X in the t-shirt block would work. I like Tartan's idea. I haven't made one. It looks very nice. 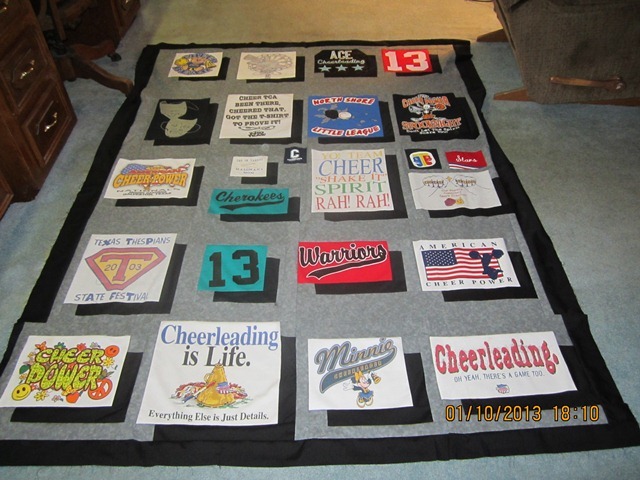 T-shirt quilt will be my project next year. For DGS will be graduating. Will be watching your progress. 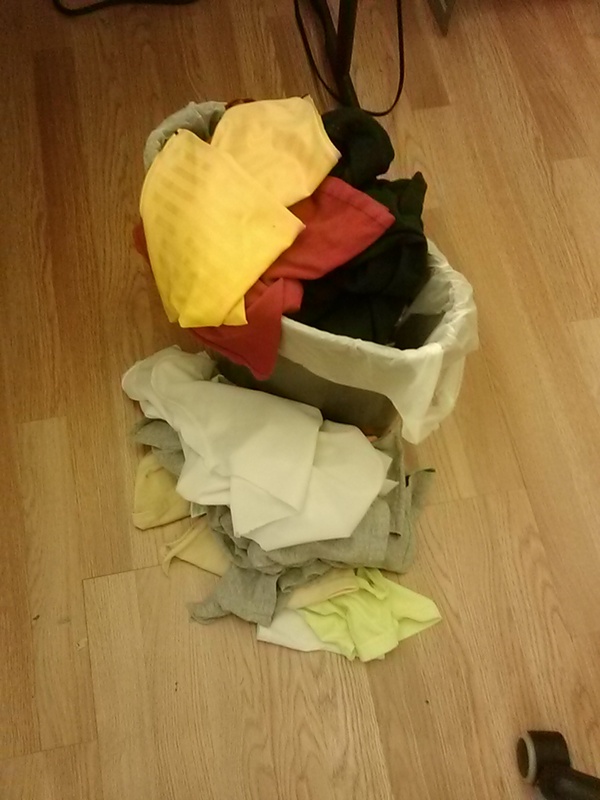 Save the scraps (rest of the t-shirts)! They make great rags for cleaning! I did a t-shirt quilt tutorial for beginners on our blog a couple of months back, but apparently I'm not allowed to post a link to it here. It might have given you some helpful tips. Sorry! Cindi, I love your quilting ideas! You can add your blog address to your signature line. I don't know how to do it but if you look at the bottom of a lot of the other members posts, they have their signatures, websites, etsy etc. Sure wish I could see your site! I'd love to, but they consider it "self-promotion" and don't allow it Sorry! 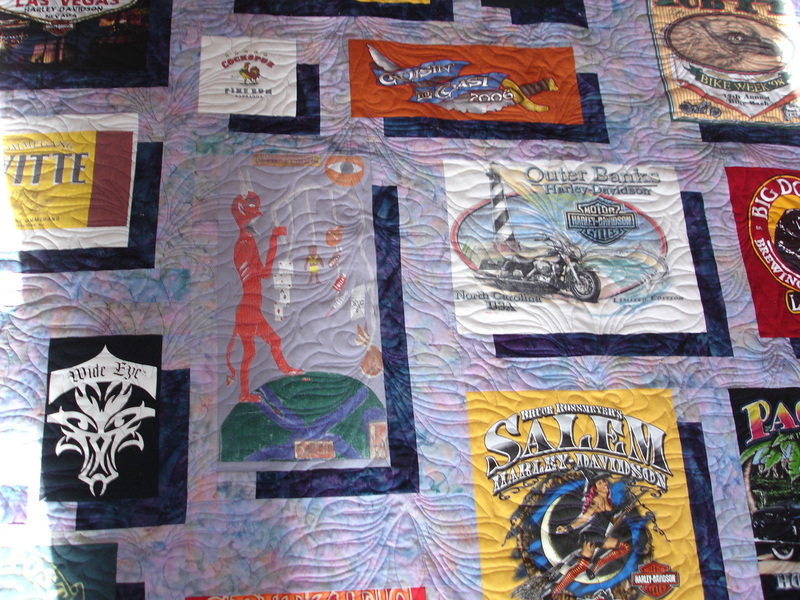 There's several of pictures of T-shirt quilts I've done on it. ​Yahoo, I clicked on your name to PM you and lo and behold.....your site is on your profile page! I like the beige and brown sashing/cornerstones. You were given good ideas for the quilting. I haven't had much success in quilting my tee shirt quilts. My machine has a hard time going over the "rubberized looking" logos. Lately I've bought a teflon presser foot to try to do my next t-quilt. Hope it works. I love the FMQ on the "trip to Australia" quilt. 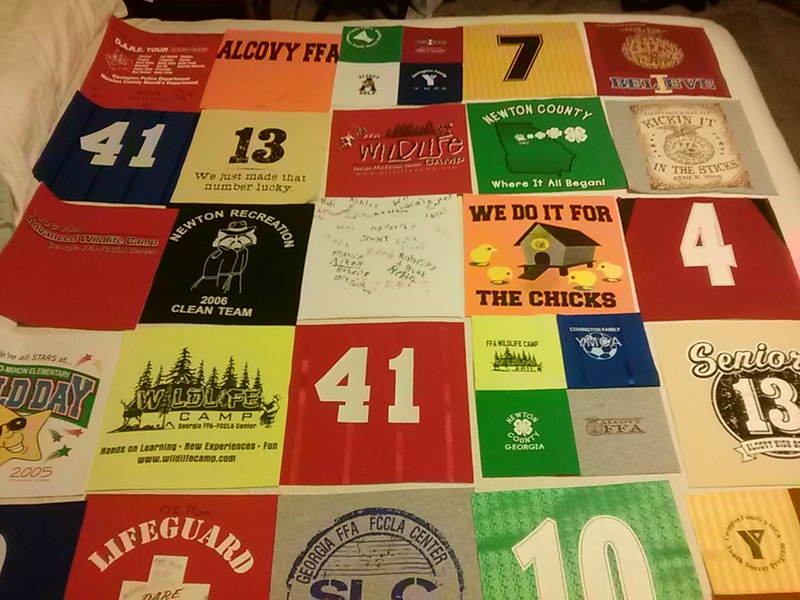 My next tee shirt quilt (for our graduate this coming year) may be a QAYG so I can try FMQ on a block at a time. I can hardly wait to see your quilt. The shirts are so interesting and colorful. Good luck. You've got the hardest (most tedious) job done already. 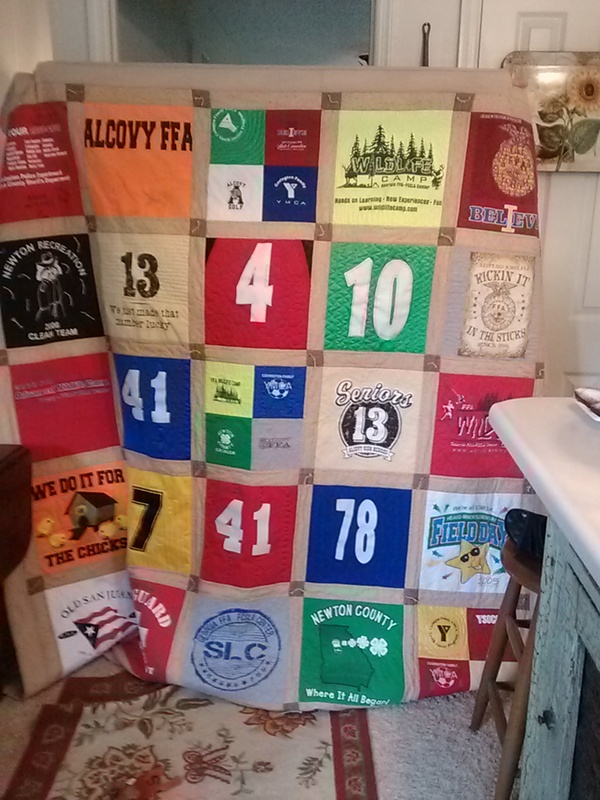 I just finished a large t shirt quilt. Took it to a lady that long arms and she quilted mostly an open swirl design but the great thing she did: she did not quilt over any of the words or symbols. It really made the t shirts pop when she was finished. Good luck. I haven't had much success in quilting my tee shirt quilts. My machine has a hard time going over the "rubberized looking" logos. Lately I've bought a teflon presser foot to try to do my next t-quilt. Hope it works. Gail, I did sewed over the rubberized logos - once. Never again. I'll quilt around it, in the open spaces (like the middle of an O), and in-between the lines, but I've given up on quilting over the logos. It really does seem to make the shirts stand out more, especially after they've been washed. Love that quilt, Sak658! I saw that pattern a couple of months ago and it's on my bucket list for my next t-shirt quilt! Hi - well, here is the quilt top minus the borders. The one mistake I made is on some of the quilt blocks I used a stiffer stablizer than on others, consequently, the quilt doesn't manuver and bend as well. I am quilting on a Singer 301A and I'm afraid I'm not going to be able to quilt this as neatly as I would like. Thinking about just tying this quilt. The mother of the boy I'm doing this for probably doesn't want to spend the money on a longarm quilter. Also debating what kind of batting to use. I think a low loft W&N would be best as my machine doesn't like the poly batting at all! Also my 301 doesn't have a walking foot to do the SITD very well. Taking my time on this one, don't want to make any mistakes. so I'll be watching this and hoping for lots of great suggestions!!! Ditto to Tartan's suggestion. The boy is going to be pleased. T-Shirt quilts are so soft. oh -- sandwiched the quilt and ready to quilt it. Not sure what to do...This quilt is huge and my 301a isn't big enough to manage it. I could turn the machine 90 degrees like someone said. That could work. Thinking of just tying it off every fist width. Has anyone ever finished a quilt this way? How did it work out after being washed? 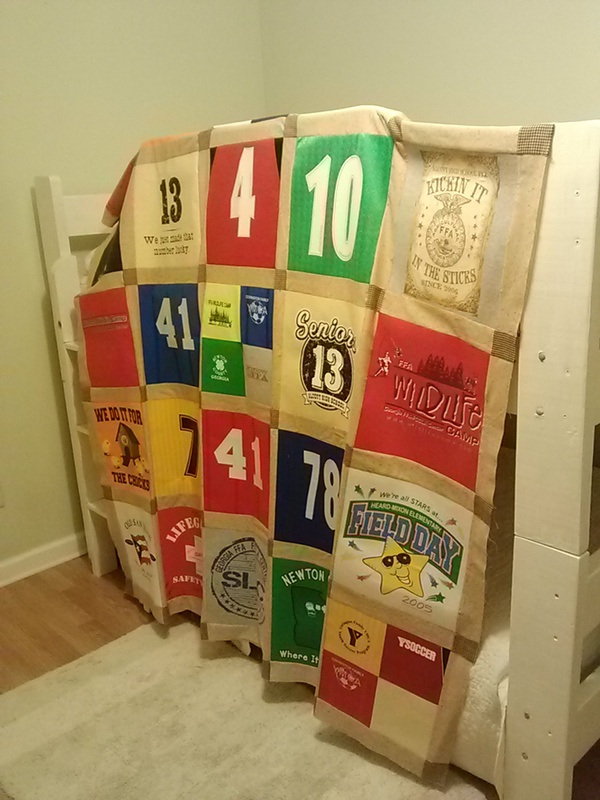 T-shirt quilt for friend's son - completed!